In this blog entry I would like to convey some of the experiences we made throughout an SDI HANA to HANA (H2H) implementation project. To gather an understanding of the context, we will start off with the scenario description and solution architecture. You can expect practical insights into the implementation of a HANA to HANA repliction scenario. Some detailed aspects on e.g. task partitioning, replication task design or monitoring are described. Potentially you can adapt the approaches described in this blog in your own SDI implementation project. The following illustration shows the architecture in a facilitated way. From an SDI point of view there are multiple real-time + batch input streams: Suite on HANA systems, files, legacy data from IBM DB2 DBs (not shown). In the productive environment (as shown) each Suite on HANA (shown as HDB1/2/3) is connected employing a dedicated DP-Agent group with a HANAAdapter instance. Thus, the risk of stalling the whole replication when remote sources or RepTasks exceptions occur on source system level can be mitigated. The Hadoop and Vora part, shown on the right-hand side will not be further elaborated and are not part of this blog entry. Initially, most of the aspects (for users + authorizations) considered in the official SDI Best Practices Guide were implemented(refer to references section for the web link to the bast practices). Using this pattern, you can easily follow a segregation of duties approach and avoid unnecessary and unwanted situations in development or deployment. On the contrary, you have to stick with the approach and align your development and administration processes accordingly. It is targeted to consolidate all source data (SAP ECCs) into one target schema. In this sense, source tables of the same fashion are replicated into one consolidated target table. In scope were about 550 tables which have to be replicated with different volumes and different change/delta frequency. For the largest tables, dedicated remote sources are planned to be introduced. This would translate into a remote source count of 7 for the largest SoH source. Since each remote source gets its own receiver/applier pair assigned (in the dpserver), this makes sense from a parallelization and performance perspective. On the downside, you have to create dedicated source system users and of course you need to maintain and organize your solution considering the set of different remote sources that are in place. In the following illustration each red arrow represents an own remote source. We observed quite a few tables that initially consumed much time (> 24 hours per table). By introducing task partitioning within RepTasks, combined with a proper sequence of loading we could achieve major performance improvements. Hereby, the challenge is to find appropriate columns and value ranges. 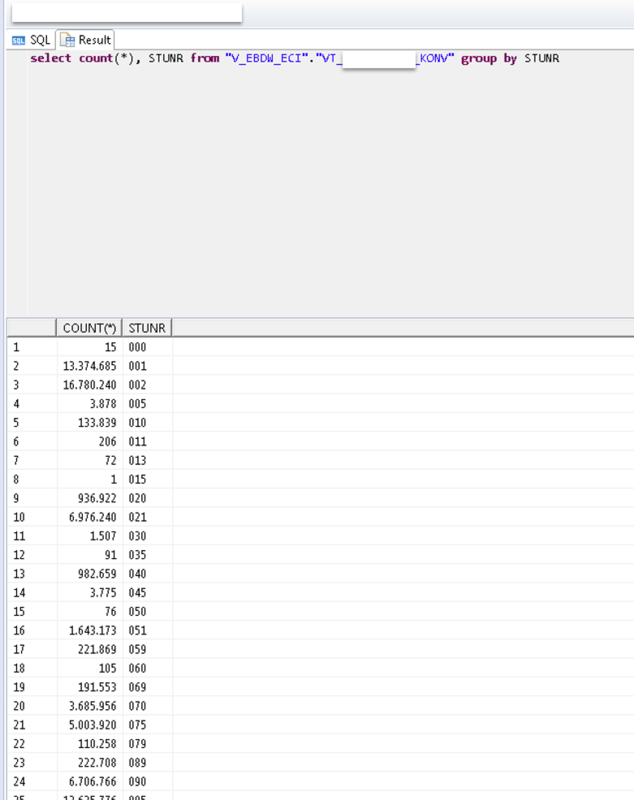 Imagine a tables such as MARC (SoH Material Master Plan View) with 1.9 billion records and you should define proper ranges for your range partitioning approach. How do you do that? The solution is the profile your data with generic SQL procedures or by using other tools. Potentially you have experts at hand who might have the knowledge about the value distribution in those tables. This task can be tricky. 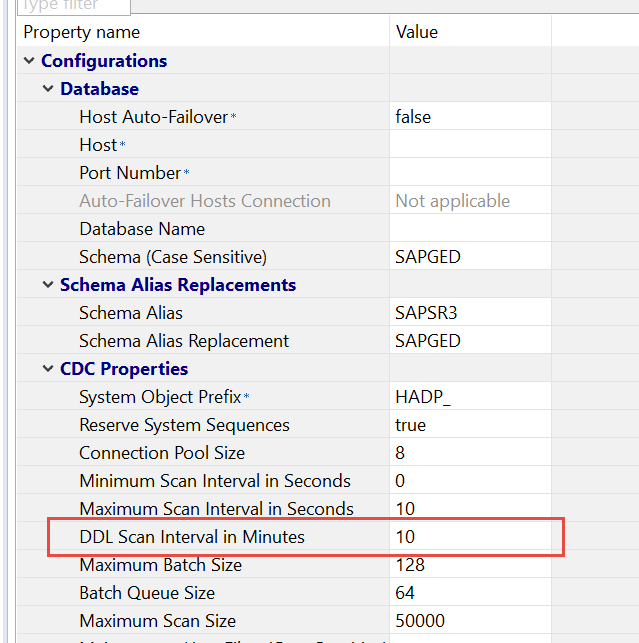 The HANAAdapter is able to capture DDL changes: drop/add column. Obviously if you load in real-time from three sources into one target table this influences the behavior for DDL changes considerably – i.e. you can’t capture DDL changes anymore as the (dynamic) structural differences between the source tables would cause inserts on the SDI applier side to fail. Throughout the implementation of the project, several changes in requirements, e.g. regarding RT structural details such as conversion expressions etc. occurred (you might know these change requests from your own project 😉 ). Therefore, some PowerShell and Python scripts were implemented in order to better apply mass changes to the SDI objects. When you have around 1.600 RepTasks you will be grateful to not touch each of them one by one of course. Doing this, you need to take precautions wherever possible. Of course, you take backups of the export you might do from the web-development workbench. After you export your SDI artifacts from the web-development workbench, you can apply changes to the XML structure. You can also do this by opening the replication task from the workbench via right click -> Open in text editor. Whatever you do in terms of editing the XML directly, you need to be aware of the find/replace operation you undertake. Of course you make sure that you only edit the XML properties you really need to! Else your replication task structure is likely to get corrupt. After applying your changes locally you can re-import the replication task in the web-development workbench. Here are a couple of examples we had to deal with. These where resolved by applying respective scripts or using common tools such as Notepad++/Sublime. 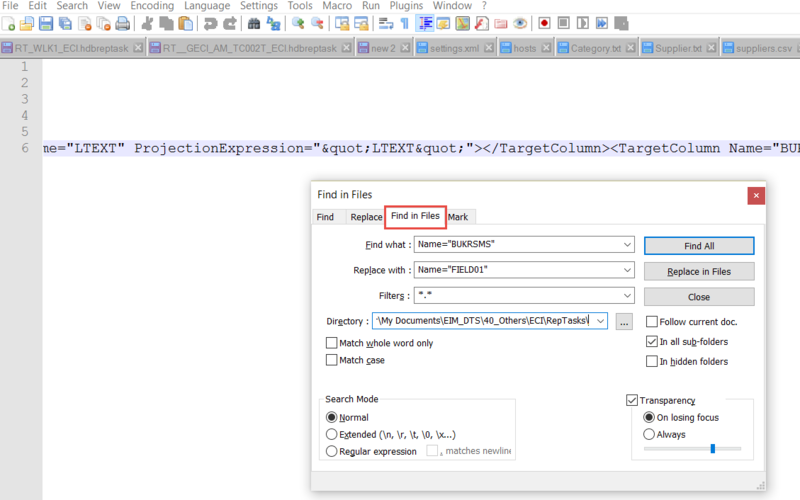 Replace “Project Expression” in all RepTasks for a defined scope of columns (specific for each table) and input proper conversion expressions such as ABAP date NVARCHAR(8) à HANA DATE format or ABAP time NVARCHAR(6) à HANA TIME fields. Using a python script, class xml.etree.ElementTree can help facilitating to parse and edit RepTask XML structures. Moreover, check if all RepTasks apply the correct filter criteria. This can also be done using e.g. Notepad++ to “scan” entire directories for certain patterns/values. 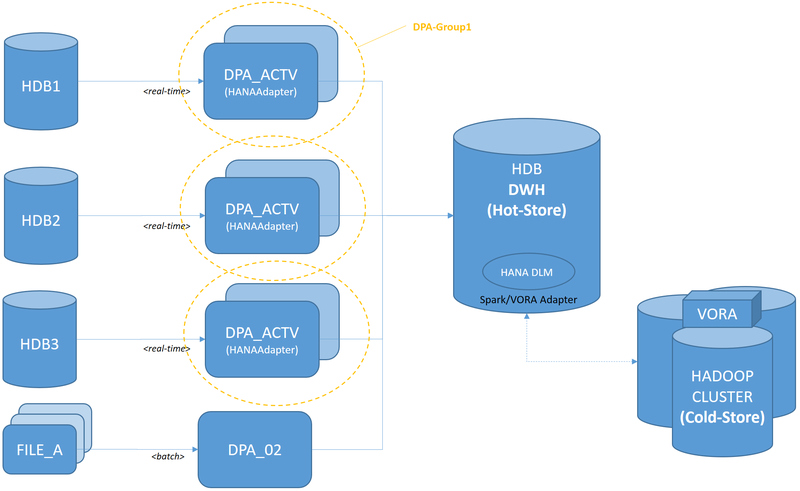 Monitoring of the SDI solution requires both the target HANA system and the DP-Agent(s). Apart from these “core” components, many sub-components come into play. Stating that monitoring the DP-Agent and the DP-framework on the HANA side is enough and your SDI solution is in safe hands would be wrong. As it is a framework, which is truly embedded into the HANA database, you need to understand (optimally) all inner mechanisms that come into play when data processing happens. However, in this blog, we only want to dedicate our attention to SDI framework related monitoring options. Please do not expect to be able to monitor or troubleshoot your SDI solution after reading this. The following shall provide you only some basic input and approaches we have applied and experienced in our project. To begin with, and most-likely well known, are the SDI monitoring views. These views unveil quite a lot of details of SDI design time objects, ongoing loads or general statuses. They also provide some control mechanisms to handle replication and load. Anyhow, when it comes to more detailed root-cause analysis, one needs to be familiar with the framework’s table, how traces are set, where log files are stored etc. A good reference here is the official SDI Administration Guide (refer to references section where links are provided). CREATED Remote subscription is created by the replication task. MAT_START_BEG_MARKER The receiver is waiting for the begin marker that indicates the first changed data to queue while the initial load is running. MAT_START_END_MARKER The receiver queues the rows and is waiting for the end marker that indicates the last row of the initial load. MAT_COMP_BEG_MARKER The receiver is waiting for the begin marker that indicates the first row to queue after the initial load has completed. MAT_COMP_END_MARKER The receiver queues the changed rows and is waiting for the end marker that indicates the last row of the initial load. The initial load has completed and the end marker is sent to the adapter. If the state does not change to AUTO_CORRECT_CHANGE_DATA, the adapter or source system is slow in capturing the changes. When the end marker is received for the initial load, the applier loads the changed data captured (and queued during the initial load) to the target. If a lot of changes occurred after the initial load started, this state might take a long time to change to APPLY_CHANGE_DATA. APPLY_CHANGE_DATA All of the changes captured while the initial load was running have completed and are now loaded to the target. To keep track of what happens on the DP-Agent side, it is advisable to have a real-time monitoring tool at hand, such as Array, Baretail or when running on Linux, some native Linux tool. It is your choice. Set the trace and log levels in the DP-Agent’s ini-files. Make yourself familiar with the paths were traces and logs are stored and access them via your tool of preference. In order to assure source and target record count are the same, you can use some prepared SQL statements to query the record counts of source and target table. Replication using the HANAAdapter is trigger based. I.e. database triggers on table level exist and react upon DMLs such as: I/U/D. If a table is being replicated, and a record in the table is archived, the database trigger interprets the archiving operation as a DELETE statement, and SDI deletes the corresponding record from the target table. The following option can be leveraged to ignore DELETE operations from an archiving run, introducing a user that executes the archiving run. This user must always be the same user. We would have an ECC source system user e.g. “ARCHIVE_USER” that executes the archiving run. All of the operations conducted by that user will be filtered out by the HANAAdapter, no deletes will happen. I hope you can learn from the experiences we made and eventually adopt some of the approaches. I will be open for questions or anything you want to challenge. Thanks for the excellent blog! Somethings cool about “SDI”! Always want to get my hands dirty on advance SDI implementation like this but hardly get any chance. One question, can this same scenario use on HANA to non-hana target, for e.g. HANA to Hadoop? You want to distribute data from your HDB to e.g. a Hadoop target using SDI data flows (RepTask/FlowGraph)? You want to do that batch-based/scheduled or in real-time? we would interested for real time, but batch job with 1-3 hours is acceptable too. Any advise? In HANA 1.0 XSC we had very user-friendly interface to schedule and monitor the SDI jobs. But I am not able to see the XSA flowgraphs in earlier Data provisioning design time object monitor. Do we have separate similar dashboards to schedule and monitor XSA SDI jobs now? If it is; please could you share some documents on how to activate them in HANA XSA. Thanks! Excellent blog and very informative. We’re also implementing a SDI project to extract data from ECC and it’s good to know I’m not the only one using notepad++ to edit RTs. We had experienced an issue where partitions can’t be applied along with filters. Let’s say there’s a huge table containing data since 2000 and we’re only interested to load past 3 years, and also partition is preferred. But we noticed that partition will ignore the filters in the remote statement as well as in the log file. Not sure if you’ve seen the same issue? can you x-check if the following SAP Note is applicable in your case? Thanks Stephan, sorry for the late reply. The note 2560754 was the right one and SAP also advised the issue will remain on HANA 1.X and won’t be fixed till 2.X. Do we always have to create a target table for the SDI replication, or does it create a default table using the same name as source with the same data type structures? Can we schedule the SLT replication as real time or non real time ( again like how it is in SLT). Can you please give details about S 4 HANA ABAP CDS view as source with SDI. to my knowledge you should be able to leverage CDS views using the ABAP adapter. Please go ahead and check. I haven’t checked myself but as far as I can remember some colleagues of mine did this. We have Replicate from ECC HANA DB (Host-XYZ) to BW HANA DB (Host-ABC) – On top of this we use BO for real time reporting. Now, where do we deploy DP agent? on Host ABC? or On HOST XYZ? or do we need separate host for SP agent that is near to ECC HANA DB(Host-XYZ)? per best practice, it is suggested to have DP agent as a seperate server near the source. In this case should be your ECC. as the SDI documentation is outlining, the DP agent should be deployed “as close” as possible to the data source (from a network topology point of view). You can either install it directly on the machine where your source DB sits or you have a dedicated (can be virtual) server. For production purposes a dedicated machine is the preferred way, for pilot scenarios you might install it directly on the source. Excellent Blog, thanks for sharing!! I have an question. In our scenario, we will replicate data from SAP ERP (Oracle DB) to HANA. We plan to replicate around 500 tables, and of course, we would like to avoid to create reptask one by one. We want to create a script, with as input, the list of table, and then generate the XML for all tables. However, how do we (how did you) deal with the tag <TargetColumns><TargetColumn>? Do we have to specify, for each tables, the columns? If yes, I’m not sure to understand what your python script do. I think there was a misunderstanding in the section where I describe the Python script usage. The script we have used did not create the replication task files up from scratch. What we did using pythons are replace operations in the XML structure or optionally small extensions when new columns had to be introduced. The columns + properties + exact syntax we prepared upfront and then ingested into the script as variables/parameters. Potentially it is thinkable to automate the creation of replication task objects. For this purpose however some more scripting would be required, also leveraging python HANA drivers to access the DB, get metadata etc. First of all, very usefull blog! We are working on a similar setup, over 20 tables to be replicated in real time. We have completed the initial load. If I check the Data Provisioning Design Time Monitor (sap/hana/im/dp/monitor/index.html) I see all the replication tasks executed succesfully. If I check the Remote Subscription Statistics I do see also a Received Count, Applied Count. The last message received and applied however remains on the initial load timestamp. However if I validate the data, I only see for 2 of my replication tasks data being added in the target tables. It looks like the other remote subscriptions are queuing their data and not ‘offloading’ into the target table. If I check the table M_REMOTE_SUBSCRIPTIONS, all my subscriptions are having the same state “APPLY_CHANGE_DATA” which is as you point out the real time replication status. Is there anything we need to trigger to start the writing of the data (need manually trigger or something like that) ? Great blog, thanks for sharing. I have a quick question about the Maintenance User Filter option. Can you have multiple usernames or restricted to just one? to my knowledge it is one user you can maintain per remote source. Great blog, thanks for sharing. I have a quick question about the SDI replication of tables in to Target system HANA. we are planning to adapt SDI. Let me give you brief about the issue currently we are facing while using SDA(Smart Data Access). 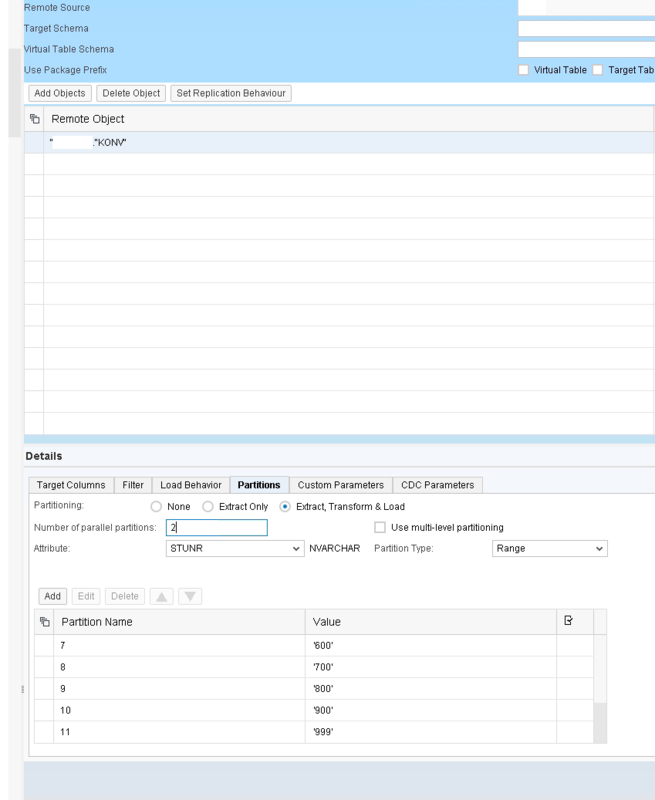 We have side-car scenario: replication of virtual tables into HANA using SDA. We are using HANA SPS12 version. We read data from APO system using SDA connection in HANA. The Volume of data from APO is 150 million on daily basis. We use SDA to load Data into HANA using Stored Procedures. We have two Store procedures both will hit SDA for different tables in APO. When we execute two procedures parallel consumes more time than executing sequentially. For example, i.e. execution of two procedures at a time consumes 10 mins., where as sequential execution consumes 5 mins. (2 min + 3 min). Can SDI will help to improve the performance of parallel access. I have been trying to generate an artifact of replication task (.hdbreptask) in XML format without using RepTask-Editor and deploy the artifact. 1) Generation of artifact and deploy it using odbc-adapter should be working fine. Could you please advise me how to correct the error? Is XML-syntax for both adapter the same or different? Where can I get the docu about xml-syntax? I am not aware of any official xml related documentation for SDI replication tasks or flowgraphs. If you still want to continue generating it on your own I suggest you create yourself a replication task based on a virtual table that sits on a remote source of an ODataAdapter via the Web Development Workbench. Take the result and interpret the structure of the xml. I can’t tell you if there are any differences and I would have to check myself. Your proposal is exact what I wanted to do, but unfortunately I don’t have the system for this scenario (Web Development Workbench + remote source of OData Adapter). What I have is only the scenario Web Develompment Workbench + remote source of odbc adapter and remote source of SparkSQL adapter. I am very greatly appreciated, if you can share me the structure of xml generated by Web Development Workbench with OData adapter. My question is related to HANA Replication task (hdbreptask) in HANA web based development workbench. The filter option seems not working . It means when I extract the data from ERP to virtual tables in HANA Cloud DB the filter was not working as expected. But in flowgraph (hdbflowgraph) filter seems to work. But my requirement is to extract the filtered data from backend SAP ERP and push it to HANA virtual tables .